Enjoy the beautiful view of Mount Fuji from the Lake Kawaguchi which is a part of the UNESCO World Heritage Site. Experience a breathtaking moment to take photos of Mount Fuji. 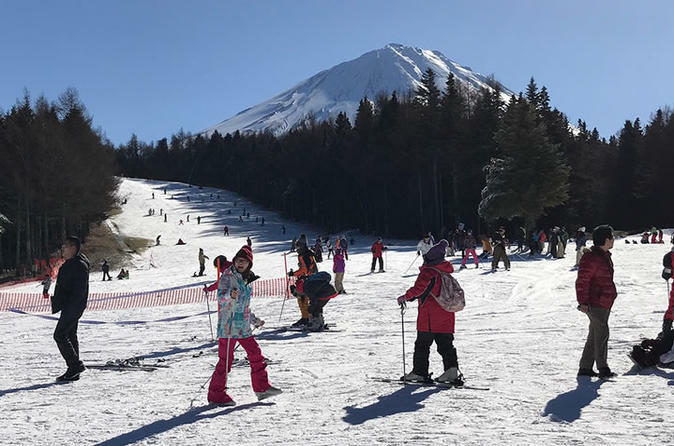 At the Fujiten Snow Resort, which is located at the base of Mount Fuji, enjoy snow fun and sled in safety. This 10-hour tour includes hotel pickup in Tokyo, transport between sites and sled rental. Get picked up between 8am to 8.45am at your centrally located hotel or accommodation in Tokyo (except Adachi, Arakawa, Edogawa, Katsushika and Kita-ward). From there, you will be taken to Fujiten Snow Resort that is located on Mount Fuji in Yamanashi Prefecture. First visit the Lake Kawaguchi, which is a popular Mount Fuji photo spot. There you can take breathtaking photos of Mount Fuji. At the Fujiten Snow Resort, you can enjoy snow sledding and snow landscape in 3.5 hours free time including lunchtime (meal at own expense), from 11:30am to 3pm. Never mind if you do not have any experience in snow sports, snow sled is fun and easy to play. Children can enjoy snow sledding in safety as the area is separated from skiing and snowboarding area, which makes this a very family friendly tour. After having fun at Fujiten Snow Resort, there will be a drop-off at the Shinjuku station around 5:30pm. The Shinjuku station is a great place for shopping and nightlife.